Chelsea travel to Wolves tomorrow with the chance to go top, provided we beat Dave Jones’ side 4-0. Wolves may be propping up the Premiership at the moment but this is just the kind of fixture that Chelsea are notoriously good at messing up. Wolves have been poor both home and away and struggling to score while Chelsea are undefeated with a 100 per cent away record and goals aplenty – to many Blues fans, all the signs indicate a Wolves win! And the fact we’re coming back from a European game in Prague doesn’t exactly help matters. 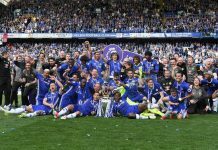 But in theory, it has to be said, Chelsea should win the game, but it will not be easy as Wolves will be desperate to record their first win in the Premier League and claim a major scalp in the process. Predicting Chelsea’s starting XI is proving extremely difficult following Roman Abramovich’s £110 million summer spending spree with few players guaranteed a starting spot. Carlo Cudicini, in goal, is a certainty. As for the rest, well I would expect to see Terry recalled to defence, and wouldn’t be too surprised if Melchiot gets a recall as well. Hopefully Duff and Lampard will start as I expect Ranieri will opt for a relatively attacking line-up to claim the three points that the fans, and most neutral observers expect us to take. Hernan Crespo may well make his first Premiership start as Mutu will probably be rested to allow him time to recover from the knock he picked up against Prague. Hopefully the Argentinean will rediscover his shooting boots after missing several good chances in Prague. For all our world class players and talent at Ranieri’s disposal I still expect it to be a relatively tight game with talent prevailing in the end.